Saputo is paying $1.3 bln for the maker of Cathedral City cheddar barely a month before Britain leaves the EU. Minimal cost savings and a healthy premium mean the Canadian buyer probably won’t earn its cost of capital by 2022. And that assumes the UK avoids an economic meltdown. 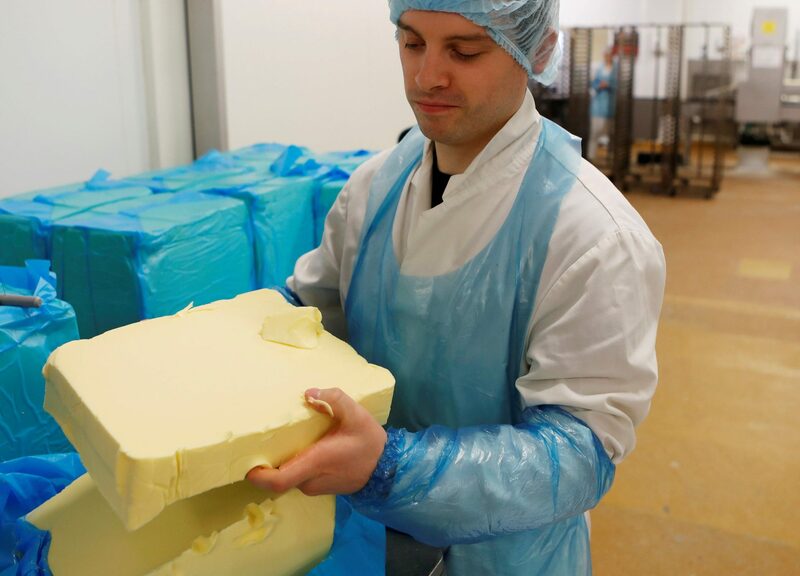 A slab of butter is cut at a bakery in Scotland, Britain, October 4, 2016. Canadian dairy processor Saputo said on Feb. 22 it would buy Britain's largest dairy food company Dairy Crest Group for about 975 million pounds ($1.27 billion), giving it access to the British market. Each shareholder will receive 620 pence in cash for each Dairy Crest share, a premium of 27 percent to Dairy Crest’s 30-day volume-weighted average share price of 488 pence. "The price premium Saputo is offering reflects Dairy Crest's portfolio of market-leading brands, its manufacturing and innovation capabilities as well as its experienced management team, who will continue to run the business under Saputo's ownership. It is for these reasons that the board is unanimously recommending this transaction to Dairy Crest Shareholders," Dairy Crest Chairman Stephen Alexander said. Saputo, which has a market capitalisation of $12.2 billion, has no operations in Britain. In February 2013, the company said it would close plants in Wales and in Heiden, Germany, the BBC reported. Founder and Chairman Emanuele Saputo told BBC Wales that the company had found the market for dairy products to be "marginal at best and highly competitive". Shares in the maker of Cathedral City cheddar cheese and Clover spread rose 12.6 percent to 625 pence by 0905 GMT on Feb. 22.